Whether you're trying to teach electrical safety concepts or you just want to provide safety reminders in your home, office, or classroom, posters can be a helpful tool. Use the two printable posters provided here and utilize the additional resources to find more great visuals to help keep you - and those around you - focused on staying safe. There are printable 8 1/2" X 11" posters attached to both of the images below, both of which are free to download and use. The first poster highlights five key points of electricity safety and the second one illustrates common home hazards to avoid. To access the poster of your choice, simply click the image. When you do, the document will open as a PDF file in a separate browser window. If you need help downloading the posters, check out these helpful tips. Right-click your mouse anywhere on the poster document that you want to print. When the menu appears, move your cursor to the "Print" command and click. If you prefer, simply place your mouse toward the bottom center of the live area of your screen and a toolbar will appear. Click the printer icon in the toolbar. Note the posters will look best printed in color. Go to the File menu in your browser and choose "Save Page As." Assign a file name and navigate to the location where you want to save the document, then click "Save." If you prefer, place your mouse toward the bottom center of the live area of your screen. One of the icons on the toolbar that appears is a diskette. Click it to save the file. Occupational Safety and Health Administration (OSHA): Visit the OSHA publications page for a variety of free electricity safety fact sheets in downloadable poster format. The page is organized in alphabetical order by topic. When you reach "E" in the index, you'll see several electricity-related posters to download, including controlling electrical hazards, electrical wires, cable trays, working safely with electricity and more. OSHA's posters are designed for workplace use. Sparklebox: This UK-based website provides several free downloadable safety posters, each one focused on a single electricity safety concept. Topics covered include electrical sockets, hair dryer usage, wire pulling, and power lines. They are appropriate for home and office use. New York State Insurance Fund (NYSIF): The NYSIF offers an electrical safety poster alongside additional electrical safety tips for construction sites and manufacturing settings. 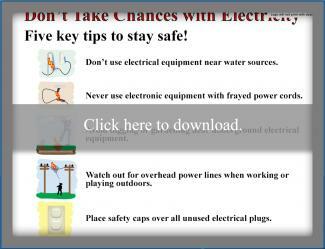 Click "Electrical Safety" in the list to access the poster and tips. 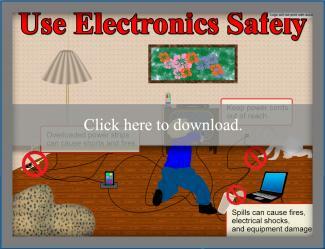 The National Safety Council: Designed for the workplace, these electrical safety posters are emailed free, upon request. Instantly downloadable posters are only available to NSC members, but anyone can request the posters to be delivered via email. 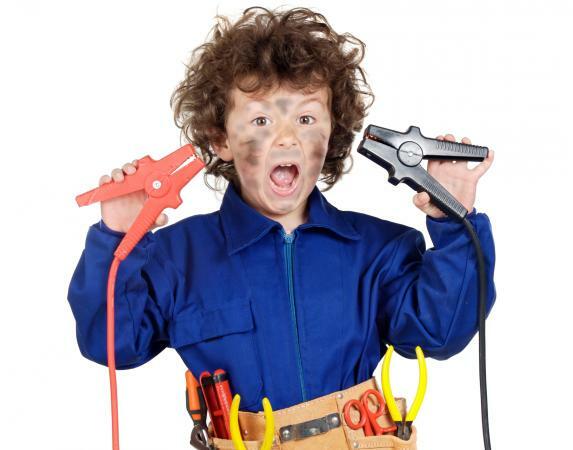 You can't be too careful when it comes to electrical safety. Hanging posters in high-risk areas is a great way to keep people focused on following safe usage practices at all times. With so many visual resources available at no cost, you can keep a few posters on display at all times. Rotate posters regularly, to keep people's attention and provide reinforcement for a number of concepts.